In Google CEO Sundar Pichai's plans for a post-device world, making a phone call from Google Home to Nordstrom or accepting incoming calls from friends and family should be possible. The voice-activated home networking device that provides answers from the search engine, streams music, and manages everyday tasks will replace the family landline phone and provide an option to make outgoing or incoming calls through the devices virtual assistant. It becomes one more piece of intimate data that provides insight into the household. Here's why marketers should care. I could answer my Google Voice number from Google Home. Connecting a video screen equipped with Duo, the mobile app Google announced at i/o, I can visually identify the caller before accepting the call. If I choose not to accept the call, Google Voice will transcribe the caller's message and send it to me via email, text message or voice message. Duo, which is taking on Apple Facetime, uses the phone number as an identifier. It will work on devices running iOS and Android. This may be my vision and not Google's, but the company has spent the last few years building each piece of the technology -- including the broadband access through Google Fiber -- to connect the dots. The company needs only to connect the pieces. This digital footprint created from an uninterrupted flow of data coming from all things connected to the Internet run by Google products will give the company incredible ad-targeting options, but not advertising as we know it today. The advertising becomes presumptions in the form of recommendations. Don't laugh. In 2013, I predicted that Google would explore and eventually manufacture semiconductors, the brains in hardware such as mobile phones and laptops. Last week the company announced it has built a fabless semiconductor, which means Google engineers designed the chip and will outsource the manufacturing to a company that can physically build it. Meanwhile, for marketers, tracking to analyze the phone call becomes simple. Marchex, which provides the ability to track and analyze calls, can already identify when calls come from home automation systems into call centers at businesses like Home Depot. Ziad Ismail, who runs Marchex's engineering and product marketing teams, said the company's technology can identify voice search features, but has nothing to announce at this time. The technology analyzes the phone call as it comes into a business's call center to better understand consumers' needs. Ismail says there is not much difference between identify and parsing a consumer call to a business like Home Depot during a voice call from a mobile phone vs. Google Home or Amazon Echo. 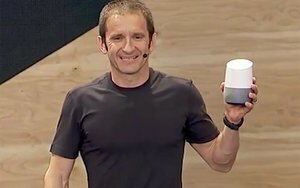 In Google's scenario, consumers would initiate the call through Google Home, which would connect Google Voice and complete the call through the Internet. Accepting incoming call would work the opposite. Here's hoping Pichai and I have the same vision.